Written by, Oomagelees (Cynthia Wilson, M.Ed.) and Nahrin Aziz-Parsons, M.Ed. 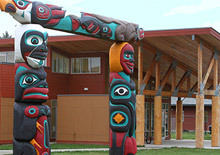 The Washington State Department of Early Learning (DEL) works with Tribal Nations to help ensure all children and families have access to early learning resources and information. This year, DEL hosted a Tribal Early Learning Language Summit, in order to further reach this goal. This was the first early learning language summit of its kind in Washington State, which is working to build bridges and foster partnerships that support young Native children’s growth and development. 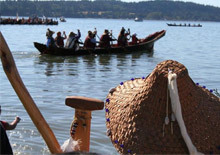 Furthermore, this language summit is closely aligned to Northwest Indian College’s Restorative Teachings Early Childhood Education (ECE) Initiative, a Tribal College and University collaborative to strengthen systems of care and learning with Native families and children. With generous support from the W.K. 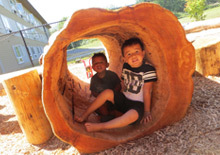 Kellogg Foundation, through the American Indian College Fund, the Restorative Teachings ECE Initiative draws upon child development knowledge from within Native communities melded with the best practices identified in the field of early childhood education. While at the language summit, we explored how learning a language is a form of exercise for the brain. Learning language makes the brain stronger and helps with many cognitive developments. As early childhood educators, we create meaningful learning opportunities that result in the growth of a child’s brain, and we also assist families in identifying this time as the opportune time to expand a child’s learning through oral language development. Exposing children to more than one language changes the structure of the brain and strengthens executive functioning skills (including mental flexibility, working memory, and impulse control). There are many benefits to learning more than one language at a time, aside from having better focus, concentration, and attention. There is extreme mental flexibility and the child is more perceptive to his / her surroundings. The bilingual brain processes the sounds of language using different parts and sections. The brain is amazing and it is has a stronger function when receiving and understanding more than one language. Research corroborates that there is increased activity in areas of brain function in babies who hear more than one language. Speaking to your child in your Native language allows the child to hear many different sounds and the brain makes space for all sounds of the language that is learned. The brain is primed to learn language early in life, so it is easier for young children to learn a second language. This makes early childhood an integral time to support children’s dual language learning. As Indigenous educators, we can teach them their own Native languages and also support them with the English language as well. While at the summit, we also discussed ways in which language plays a very important role in Tribal communities, because it is the connector to the culture of the children. Languages can be learned through many aspects in the early learning program and helps with creating a positive individual and cultural identity and enhancing one’s self-worth. When children have high self-esteem and know who they are and grow being proud of whom they are, then they become strong leaders in their Tribal nations. During the summit, many scholars and Native language speakers gifted the attendees by sharing their Native language. Most importantly, we came to the realization that although the struggle of Native language reclamation, restoration and revitalization still exists, we cannot allow this difficulty to stop our desire and our drive to help Native children learn their Native tongue. We have to create learning opportunities allowing them to be who they are, and we must also be respectful of their culture and language. This helps children grow into the healthy, capable, and competent young adults who their Nations want them to be. A child’s first five years of life are fundamentally important, because they are the foundation of health, wellness, growth and development. We must therefore ensure that we offer Native children and families high-quality early learning experiences. When walking into a classroom in a Tribal early learning program, we should know exactly where we are without having to be told. We will see it on the walls, hear it from the children, and smell it from the kitchen. We are in the home of The People whose lands are the ones on which we are standing. This is where Native children and their cultures are to be valued. By supporting and advocating for children’s Native language development, we are showing great respect to the children, their families, and communities; and in return, the children show great respect as well.